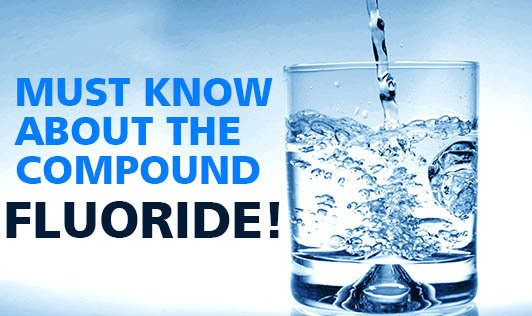 Must Know About The Compound - Fluoride! Fluoride is one of the active compound that is present in water and toothpaste. Fluoride makes the tooth structure stronger and helps the teeth more resistant to acid attacks. It also helps repair the early stages of tooth decay (before the formation of a cavity) in children. Dental fluorosis - Enamel or dental fluorosis is a condition caused by 'excessive' intake of fluoride. Cause nausea, depression, skin allergy like rash, mouth lesions, joint pain, gastric trouble, head ache, fatigue etc. A pregnant mother's fluorine intake affects the amount of fluorine found in the primary teeth that develop in the fetus. Fluoride disrupts the activity of normally functioning hormones. Fluoride can reduce levels of melatonin, the sleep hormone, in the body, causing chronic insomnia. Everyone including children can benefit the fluoride through drinking water. But if you are still concerned about the level of fluoride in your drinking water, you can use a water filter/ reverse osmosis process that can help to remove fluoride and other chemicals such as arsenic and chlorine.